Nerf weapons are some of the most versatile toys on the market. Regardless of the location or time of day, Nerf guns are made to be able to handle all types of conditions and provide you with the range necessary to be able to both sneak up on your enemy as well as hit them from as far as a hundred feet away. The only downside that some users may have noticed, however, is that it can be quite difficult to host Nerf wars at night. Unless there is lighting available in the battle location that allows for some visibility, it can be hard for players to see their targets or their shots. Luckily, Nerf has already come up with solutions for this problem by producing both guns and ammunition that glow in the dark, making it easier to see where your darts are going and where your enemies are during your Nerf battles. 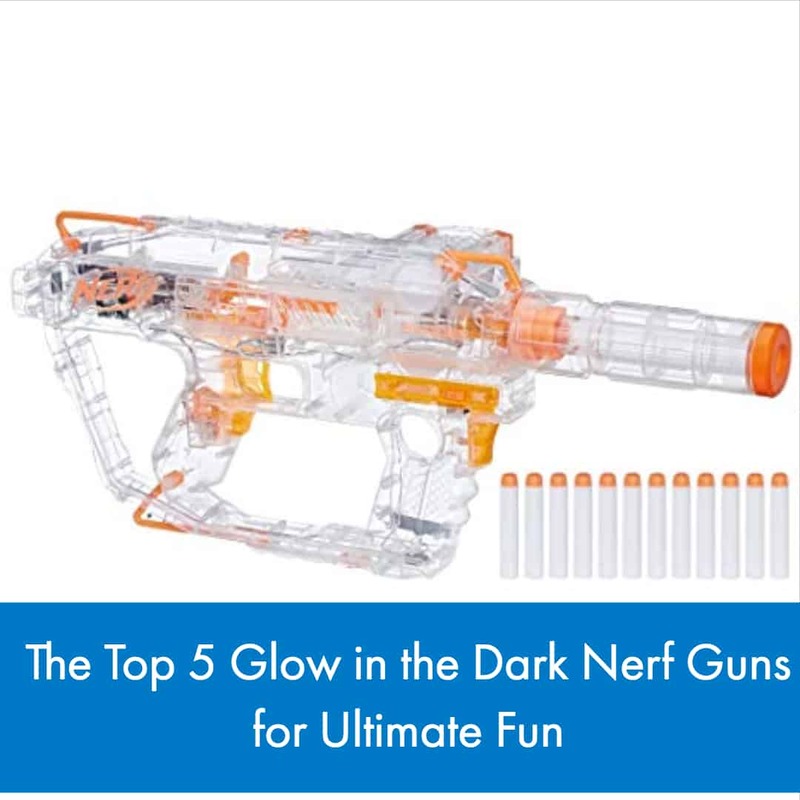 If you plan on having Nerf battles during the night, especially in locations that are going to have limited visibility, here are the top 5 glow in the dark Nerf guns that will provide you with ultimate fun and better night battles! (For this article, we are only going to discuss Nerf guns that were designed with glow in the dark features and with use at night in mind. 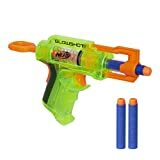 Because glow in the dark Nerf darts can be purchased on their own, almost any Nerf blaster can be turned into a gun that works well during night battles. 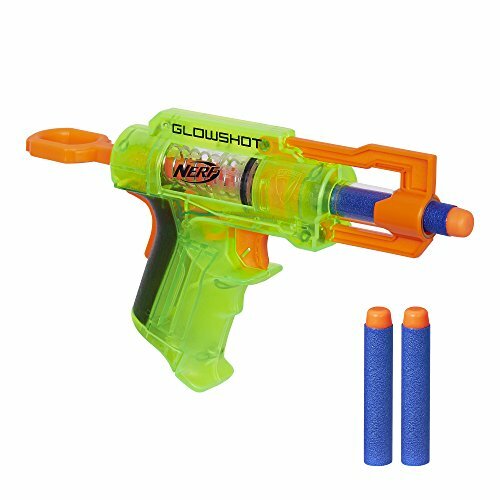 Although the Nerf N-Strike GlowShot Blaster may not look like much, this tiny blaster is perfect for those who need a backup gun or for those looking to carry out sneak attacks against their enemies. Besides the glowing capabilities of the gun, this blaster features a single barrel system that can hold one dart at a time, a pull-back cocking mechanism to prepare your gun to fire the bullet, and a button on the back of the blaster that turns on the lights in the blaster, making it perfect for those who want to be sneaky during a night battle. To use the blaster, simply pull back on the handle and load the dart into the front chamber. Then, fire at will! It’s very simple to use and the light mechanism will be activated when you place your hand onto the grip. Once fired, this blaster is said to have a range of approximately 25 feet. Overall, the Nerf N-Strike GlowShot Blaster is an extremely functional mini-blaster that works extremely well for stealth missions or for those who need a backup blaster in times of crisis! Building upon the ease-of-use and usefulness of mini blasters, our second option on this list is the Nerf Rebelle Luminate Blaster, which is part of the line Nerf Rebelle line that is specifically targeted towards their female audience. The Nerf Rebelle Luminate Blaster, unlike other Nerf offerings, uses a unique system to prepare the darts for glow in the dark action. Inside of the blaster, there is a small LED light that is activated by a button that is held down for a brief period of time. (This LED light is visible on the front of the gun, making it able to be seen during night wars.) This light then rapidly charges the tips of the darts so that they can be ready for action when the user decides to fire. 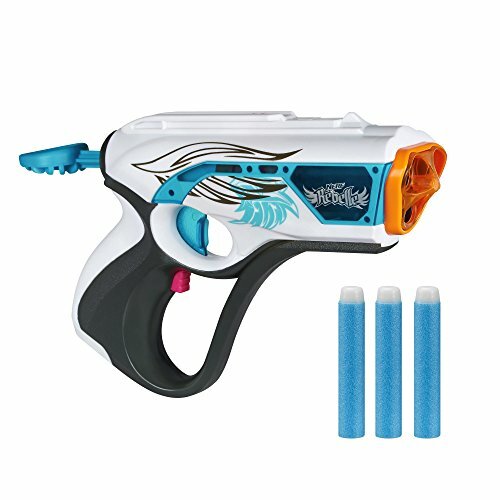 Besides the unique glow in the dark mechanism, the body of the blaster features a fashionable white and blue design that reflects the overall theme and attitude of the Rebelle series, a barrel that is capable of holding and firing up to three bullets, and a pull-back cocking mechanism that makes the blaster easy to use. To use this blaster, pull back on the handle and load your three bullets into the front of the blaster. Before you shoot your bullets, press the pink button located underneath the trigger to activate the LED light. This light will charge the tips of your bullets so that they will begin to glow in the dark. Once your dart tips begin glowing, you can then begin shooting your darts. Each dart will shoot out one at a time and will require you to pull back on the handle before each shot. Each bullet is said to travel approximately 85 feet, which is very impressive for a mini blaster such as this one. 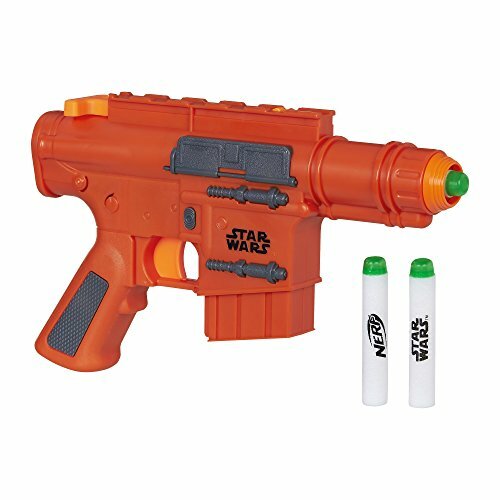 The only downside that can be seen with this blaster is that it requires special darts, which can be costly and inconvenient to replace. Besides that minor inconvenience, however, the Nerf Rebelle Luminate Blaster is another excellent glow in the dark gun choice for those who enjoy fighting at night. 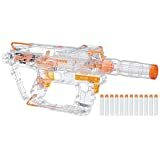 If you’re looking for something with a little more firepower than the previous two suggestions, you should look into the Nerf N-Strike Modulus Ghost Ops Evader. The Nerf N-Strike Modulus Ghost Ops Evader is a semi-automatic blaster that features a transparent body designed specifically for battles in low-light locations. Much like our first selection, this blaster houses several lights throughout its body that are activated when the user presses a button. Unlike previous mentions, however, this blaster is fully-motorized and comes with a dart clip that holds up to 12 glow in the dark bullets, making it the perfect choice for those who need a blaster that is easy to reload and fire for close and far range combat. Speaking to the design and the features of this gun, the body is lightweight and easy to carry around the battlefield and is also highly-customizable since it is a part of the Nerf N-Strike Modulus series. The only downside that buyers tend to experience is occasional difficulty operating the gun so it is important to know how to use it prior to purchase. To operate the Nerf N-Strike Modulus Ghost Ops Evader, simply load your clip into the side of your blaster. Once it is firmly loaded into the side of the blaster, you need to press down on the switch underneath the trigger, which will activate the motor. You can then press the trigger as fast as you would like until you run out of bullets. To turn on the light system within the gun, press down on the large button located under the barrel. Besides the motor component of the blaster, the rest of it is easy to use and received very few complaints from buyers. The Nerf N-Strike Modulus Ghost Ops Evader is an excellent weapon for all of a combatant’s needs. 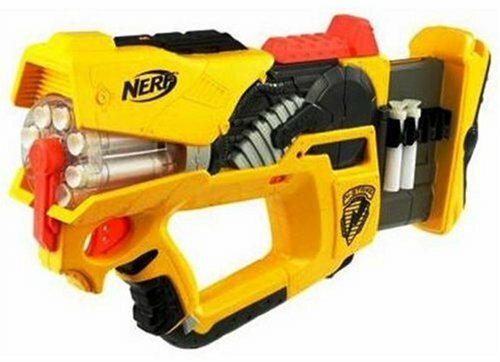 For those who don’t need massive amounts of power but who would still like a blaster with a larger ammo capacity and the ability to still pack a punch, the Nerf N-Strike Firefly REV-8 is the way to go. The Nerf N-Strike Firefly REV-8 is a blaster that has a light up barrel capable of holding up to, you guessed it, eight glow in the dark Nerf darts. Every time that you fire a bullet through the air, the barrel explodes with a brilliant flash of light and sends your dart glowing into the darkness. This blaster is an extremely useful addition to anyone’s gun stash, featuring an easy pull-back cocking mechanism, front-loading capabilities that makes it simpler to load your bullets in after you have fired all of the darts in your barrel, and additional side bullet storage so that you don’t have to run and get all of your darts after your barrel has emptied. The FIREFLY REV-8's barrel lights up when you pull the trigger and sends glowing darts up to 30 feet away! The rotating barrel holds up to eight darts--just pull back to power up, squeeze the trigger, and fire! Blast away and watch the barrel burst with light as you send glowing darts flying through the night! Blaster comes with eight glow darts, label sheet and instructions. Go NERF at night! Take your battle into the darkness with the N-STRIKE FIREFLY REV-8! All you have to do to use your blaster is to load all of the bullets into the barrel, pull back on the handle at the top of the device, and press down on the trigger. The light will go off automatically each time you pull the trigger and this is all that you have to do to work the gun! Once fired, it is said that your darts will travel approximately 30 feet. Despite having a lesser range for a larger gun, the blaster functions as promised for many users and is a great glow in the dark toy for nighttime battles. As it is often said, we saved the best for last as the Captain Cassian Andor Deluxe Blaster offers some truly unique features that separates itself from the rest of the blasters on this list. The Captain Cassian Andor Deluxe Blaster is one of four blasters that is part of the line promoting the Rogue One Star Wars movie. This blaster is the best option currently provided in the series, which is why we felt the need to add it to this list. This Nerf gun is another fully-motorized, semi-automatic blaster that uses special light technology in order to charge the glow in the dark Nerf darts. Unlike other blasters, however, this blaster features a light near the clip that helps to charge the bullets as well as another bright green light that follows the path of the bullet as it exits out of the chamber. Featuring a bright blue, long body, a scope to help you seek out your enemies, dart clips that are easy to load and put into your device, and laser blast sound effects that make noise each time you shoot a bullet, the Captain Cassian Andor Deluxe Blaster is both stylish and effective. Like most semi-automatic Nerf weapons, all you have to do to begin operation is to load the clip in, hold down on the button located just beneath the trigger, and start firing! Since the clips don’t hold as much as some, you will most likely run out of bullets rather quickly but pre-loaded clips will always make this process easier. There seems to be very few complaints with this blaster, making a desirable option for those who want something sleek, attractive, and functional. Nerf battles at night are amazing but only if you have the right tools to be able to see your enemies and your shots. If you are thinking about hosting a Nerf battle in the near future, use the suggestions above to find the right glow in the dark Nerf guns that will work perfectly for you, your team, and your opponents. Are you having trouble figuring out which glow in the dark Nerf guns or which Nerf guns that used glow in the dark darts are going to work best for you? To get a better idea of what you may be looking for and what will help you in your situation, check out this YouTube video for some additional tips and pointers.